Last week this was someone’s home. Though I don’t expect anyone will come and smash in my apartment this week, this event motivated me to do some research on Turkish property laws. I’ve heard lots of different things in the past. I was told that Turkey has squatter’s rights, which means that if you build a house overnight, you can legally live there even if it’s not on your property. I’ve also heard that you don’t have to pay taxes on apartment buildings if the top story isn’t completed, which explains why many Istanbul buildings have an unfinished top floor. 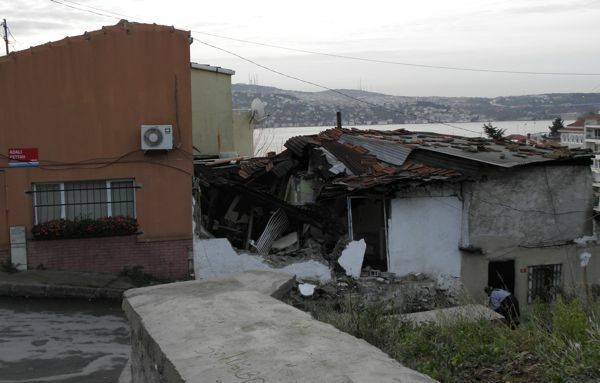 They say that many old Ottoman houses are crumbling because no one claims ownership or the ownership is in dispute, and it’s illegal to destroy them until they collapse. Time to sort fact from fiction. It’s all about history. In Ottoman times (1299-1923) all the land belonged to the state—the sultan. 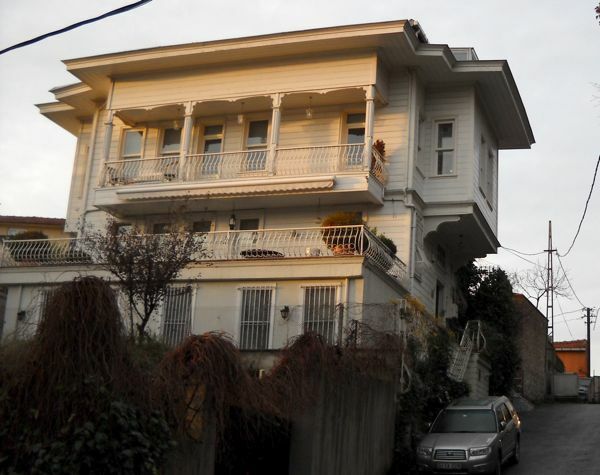 Ownership was a totally different concept then, which must affect the hazy property laws of modern Turkey. It’s sort of like the Native American theory that everything belongs to everyone, right? I think the Native Americans were clever to take mirrors and trinkets in exchange for land, since they were getting paid for something that belonged to everyone. With my students I use the example of air. When I offer them each one dollar for a square foot of the air in the classroom, they all take me up on it. Why? “Because you can’t own air,” they say. Well, in Turkey people built houses in any available space, using whatever materials were available to them. It worked. 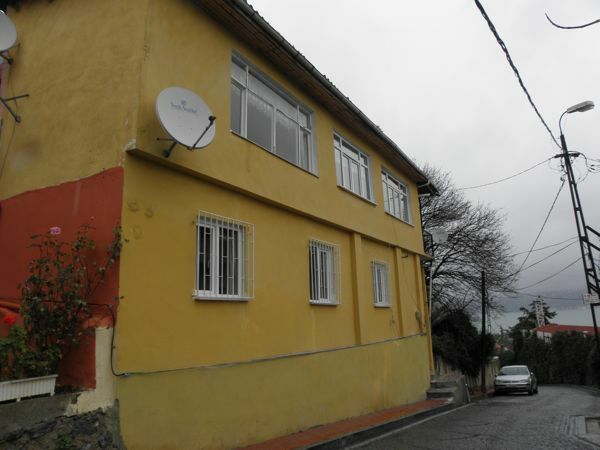 …and a lovely Ottoman home a few doors away. In 1923 when the Ottoman Empire ended, Ataturk founded the Turkish Republic and instituted numerous reforms, including a huge population exchange— mainly between Turkey and Greece. Turkish Christians were deported to Greece, and Greek Muslims were imported to Turkey by the hundreds of thousands. Just imagine all the vacated homes in both countries, all there for the taking. Unfortunately, many were left vacant. 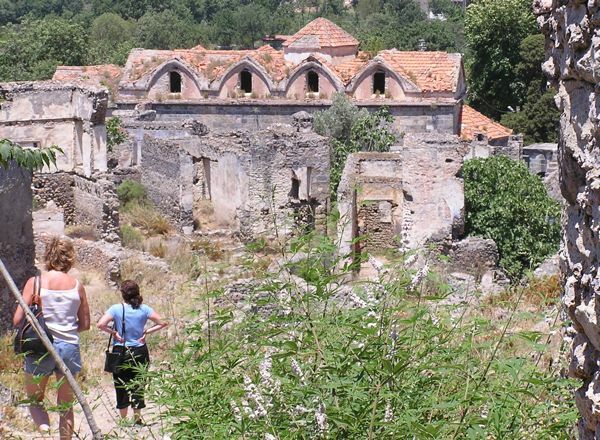 Kayaköy, a city frozen in time, is one of a number of completely deserted cities in Western Turkey near the Aegean. At any rate, the population exchange confused property ownership all the more. 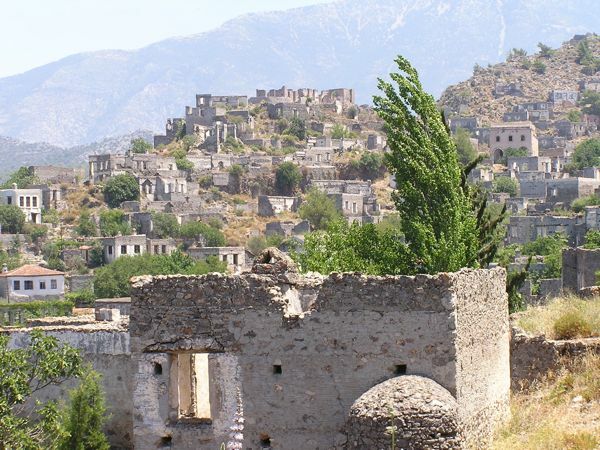 Kayaköy, a city abandoned after the population exchange. 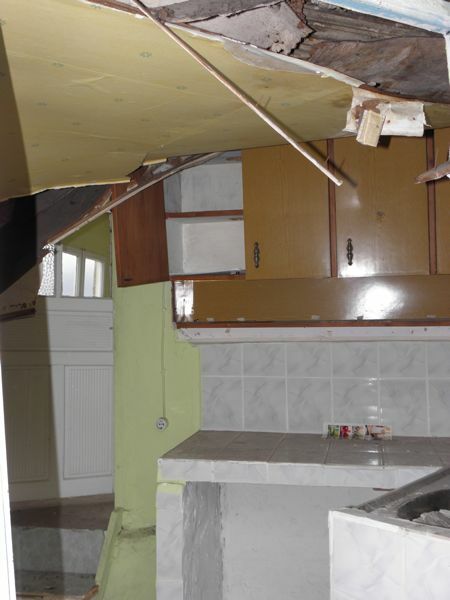 Someone fixed dinner in this kitchen just weeks ago. A few years ago my Turkish book group read a book of stories recounting the trials of people trying to establish a gecekondu community, Berji Kristin: Tales from the Garbage Hills, by Latife Tekin. A rather bizarre series of tales, it opened my eyes to the tribulations of these “shaky” communities. So—after reviewing the history, what’s the reality here in little Arnavutköy, which I’ve grown to love? 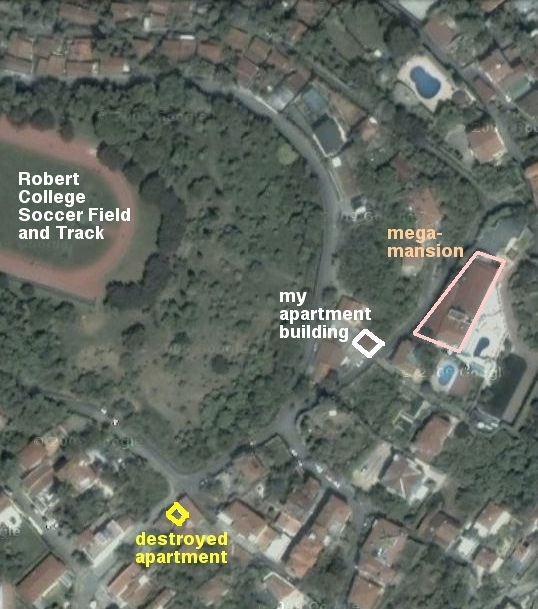 Well, the reality is that among and between all these incredible mansions (I’m surrounded by them) are many makeshift homes, mostly concrete-and-brick construction. Could they have been built in a night? I find that hard to believe, but who knows? Take a look at the Google map of my little neighborhood. My apartment building is about 50 feet across the front, so compare that to the mega-mansion across the street, complete with a pool and 8-foot fences all around it. The tiny little apartment up the street (maybe 20-25 feet square) is now rubble. Though it had a makeshift corrugated roof, its brick, stone, and concrete construction was typical of the area. My Arnavutköy neighborhood. Most of the smaller roofs are gecekondu (upper left). I talked to my neighbor Candan about it one morning on my way to school. As he dragged his big bulldog Pablo along, he explained that the land belongs to the Orthodox church, and that they probably ordered the demolition. “The little place next to it will be destroyed as well,” he said. 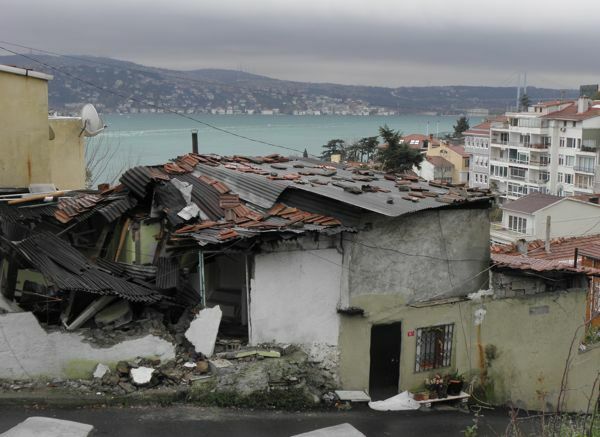 “It’s a terrible time to do this, in the middle of winter, but these houses are illegal.” He continued to explain that although religious minorities are protected under the Treaty of Lausanne (1923), they are not allowed to build anything new in Turkey. He’s quite sure they can neither sell nor develop the property, so I don’t understand who benefits from this demolition. Yet another view–what’s the fate of the woman working outside the right-hand apartment? In discussions with my peers I’ve learned that political ties (or the lack thereof) can mean the destruction of a home, a business, or a school. 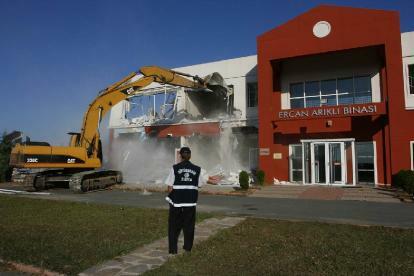 In fact, this fall a relatively new school in Istanbul, the Kemer School, was bulldozed two weeks before school started. 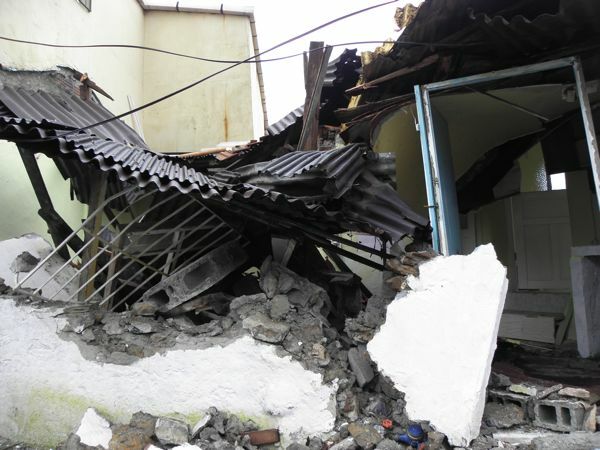 Apparently the school was built illegally, which is the case with many schools and buildings. It makes one wonder—and worry. Great reporting Ann Marie! Good to know the facts since I too had heard various versions of what the laws were surrounding Gecekondu. I was about to write about the gecekondu phenomena in Turkey. After a few short post, would you mind if I linked to your post on the subject? I just discovered your blog so I haven’t looked it over too much yet.. I will. Looks wonderful. No problem. You may need to have them do a search for gecekondu, though. I don’ t think there’s a separate url for each post. Good luck!